There are 13 races complete and three left to go in the 2017 NASCAR Whelen Modified Tour championship points chase. Heading for the ‘Magic Mile’ of New Hampshire Motor Speedway, the top three drivers in the standings are seperated by just nine points. And there promises to be a new championship leader when the weekend is done. fwwebb100_nwmt_16Points leader Ryan Preece, who has five victories this season, holds a six point lead over Doug Coby and it’s nine points back to Timmy Solomito. However, Preece will not be competing in Saturday’s F.W. Webb 100 because he will run his third NASCAR XFINITY Series race of the season for Joe Gibbs Racing instead. With Preece not racing, Coby and Solomito begin an intense battle. Coby has one victory, but Solomito has been able to roll into the winner’s circle four times, including the last series event at New York’s Riverhead Raceway. In their career at New Hampshire, Coby clearly has the edge. Four victories for the Milford, Connecticut driver is compared to Solomito, who has just one top 10 in seven starts at the 1.058-mile oval. With the larger field, should Coby and Solomito falter, there are several contenders waiting to pounce. Justin Bonsignore is 15 points behind Solomito, and Rowan Pennink is another nine back. In addition, if misfortune strikes both Coby and Solomito, it would keep Preece in contention. Event Schedule: Friday, Sept. 22: Garage Opens: 6:30 a.m., Practice: 10-11:20 a.m., Qualifying: 2:30 p.m. Saturday Sept. 23: F.W. Webb 100: 3:30 p.m. The Race: The F.W. Webb 100 is the 14th of 16 points championship events on the 2017 NASCAR Whelen Modified Tour schedule. This is the second and final stop at New Hampshire Motor Speedway this season. In July, Bobby Santos scored the victory in the Eastern Propane and Oil 100 at NHMS. The Procedure: The maximum starting field per the entry blank is 38 cars. The first 32 positions will be determined through the qualifying process, while there will also be six provisionals available. The race is scheduled for 100 laps (105.8 miles). The Track: This will be the 67th NASCAR Whelen Modified Tour race at the ‘Magic Mile’ dating all the way back to the inaugural race in September of 1980. The first ever race at NHMS saw Mike McLaughlin visit Victory Lane. New Hampshire Motor Speedway also holds Monster Energy NASCAR Cup Series races twice a year. Race Winnners: In the 66 previous Whelen Modified Tour points races at NHMS, 21 different drivers have visited Victory Lane. Mike Stefanik leads all drivers with eight career wins at the 1.058-mile oval. The win for Santos in July was his second career there. The defending winner of Saturday’s F.W. Webb 100 is Justin Bonsignore. Pole Winners: There have been 26 different drivers to capture a Coors Light Pole award at New Hampshire, led by Jan Leaty, who had six poles there. Among active drivers, Ryan Newman has four career poles, the most of all. Pitkat Honors TC: Just one week after his passing, Ted Christopher will be honored at New Hampshire Motor Speedway on Saturday. Woody Pitkat will sit behind the wheel of the No. 82 Horton Avenue Materials Chevrolet that Christopher piloted for much of this season. Pitkat was originally scheduled to compete in the No. 52, but will drive the Watts prepared machine instead. One of Pitkat’s three career Whelen Modified Tour wins came at New Hampshire in 2014. In addition, NASCAR will have a commemorative decal for all the NASCAR teams as well as NHMS vehicles for the weekend. Coby In Position: Another podium finish at Riverhead has four-time series champion Doug Coby in position to capture another championship this season. Coby enters New Hampshire seeking a fifth win at the ‘Magic Mile’ after finishing 11th there earlier this year. 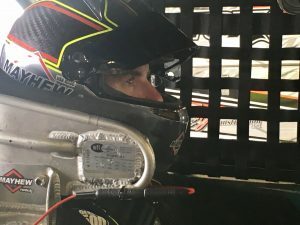 Coby has six straight finishes inside the top four in the last six Whelen Modified Tour races, which has put him right back in position at the top of the standings following a rough start to the season. McKennedy Filling In: With Ryan Preece missing the race, Jon McKennedy will pilot the No. 6 TS Haulers Chevrolet for Eddie and Connie Partridge. Even though he will definitely be seeking his first career Whelen Modified Tour victory, McKennedy must also worry about collecting points. The No. 6 has a 32-point lead in the owner’s championship entering New Hampshire. McKennedy’s points he collects will be crucial in helping Partridge capture the owner’s title this season. In 31 career Whelen Modified Tour starts, McKennedy has just one top five, but it came earlier this season at Stafford. Solomito Smooth: It seems as though Solomito is back on track following a rough summer stretch on the Whelen Modified Tour. Solomito was involved in a crash at New Hampshire, Seekonk and Bristol over the summer and lost the points lead he once held. Beginning his crawl back to the top, Solomito finished third at Oswego and then followed that up by winning the last series event at Riverhead on September 16. Winning: In the first 13 races of the season, only two drivers have been able to visit Victory Lane more than once. Preece has five wins, while Solomito has four. Rowan Pennink, Patrick Emerling, Doug Coby and Bobby Santos III also have wins this season. The NASCAR Camping World Truck Series will compete with the NASCAR Whelen Modified Tour as the two headline divisions for Saturday. The Camping World Truck Series will begin their race at 1 p.m., while the Whelen Modified Tour F.W. Webb 100 will go green at 3:30 p.m. The American Canadian Tour will also have a Late Model feature on Saturday evening. What’s the latest on the non-points Charlotte event? Surprised it isn’t cancelled yet. Why have the northern teams haul to Charlotte? Loudon should be awesome, great weather for a New England event. Stafford was home to Teddy but man did he love racing Loudon. Stout field on Saturday but it will be different. Everything is different now. The track opened in 1990, the first race was not in 1980.